Further research is planned into a dog vaccine that offers the first potential therapeutic treatment for horses with melanoma. Dr Jeffrey Phillips, from Lincoln Memorial University in Tennessee, led a study involving horses in 2012 and 2013 which evaluated a vaccine currently used to treat melanomas in dogs. Phillips and his colleagues discovered that tumor-bearing horses responded well to the vaccine. In fact, most of the treated horses in the study showed dramatic tumor shrinkage and also developed anti-tumor immune responses after vaccination. Based on these results, Phillips plans to monitor these patients and administer booster vaccines for another two years, according to the Morris Animal Foundation, which backed the research. 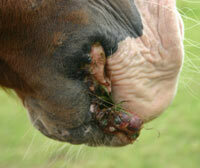 Although melanomas can occur in horses of all breeds and colors, they are especially common in grey horses. Breeds most likely to be diagnosed with melanomas include thoroughbreds, quarter horses, arabians and paso finos. I have read the post and it is really a very helpful post as there are lots of information about the treatment for the dogs.